Why Hold A Business Retreat? Holding a business retreat can be invaluable for your business, whether you’re a small operation or a large company with a strong corporate culture. Through our extensive experience helping others host successful retreats Stanford Sierra has been able to observe why a business retreat is an invaluable tool in any manager’s kit. Firstly, a business retreat allows team members to break away from their regular routine and offers an opportunity to reflect on operations and strategy from a different perspective. Approaching strategic business problems from new angles in a focused environment is a crucial element of a retreat that is hard to capture in the office. Business retreats also allow employees to develop a stronger sense of community. Having the opportunity to be in a new environment and out of one’s comfort zone with fellow employees creates an immediate bond. Having retreat time free to spend with each other at meals, socializing, and engaging in outdoor recreation allows employees the opportunity to connect over hobbies and interests they might share outside of work. Having a more well-knit and collaborative team is invaluable for a business of any size. Finally, business retreats can serve as fantastic places for continuing education. The focused and intimate setting help people feel comfortable asking questions and working collaboratively to learn together, further helping a team become more tight-knit and productive back in the office. The facilities at Stanford Sierra offer housing for 30-180 people, 5 separate meetings rooms of varying size and prearranged dining options, taking all the work out of planning. In addition, the expansive natural setting and intimate lodge-like feel allow for collaboration, team-building and focused group activities, successfully facilitating strategic reflection, a closer-knit and more well-educated team. We see these as crucial elements to the success of any business. We’d love to welcome your business to Stanford Sierra and Fallen Leaf Lake! BUILD new skills and knowledge for personal, professional, and communal wellness. LEARN about the latest research in health, science, and wellness. IMPROVE your personal health & wellness management, and that of your loved ones. CONNECT your key learnings to personal and professional lives. NETWORK with seminar presenters and colleagues. EXPLORE Stanford Sierra Camp and all that it has to offer. *GROUP RETREAT OPTION The afternoons and post-dinner time slots can be used for group meetings, and we can book you a private breakout room. Stanford groups can pay via PTAs and iJournals. Please contact TO Preising for details at preising@stanford.edu. Group rates are $590 pp. ...can you find the one still hidden? Do you love exploring? Do you love making new discoveries? Ever wish the whole world were one giant treasure hunt? Well guess what... for Geocachers, it is! Geocaching is a real-world treasure hunting game in which participants use GPS-enabled devices to navigate to specific coordinates and find hidden containers, or 'Geocaches'. That may sound a little complicated, but really it's quite simple. Just with like in-car navigation systems, hand-held GPS devices can tell you where exactly in the world you are and how to get where you want to go! Even smartphones do it these days... all using information from the US Global Positioning System. The game now known as "Geocaching" has a pretty interesting history, dating back to May, 2000. When a geocache is hidden, the owner posts the coordinates so other geocachers can go try to find it. Geocaches come in all shapes and sizes, with varying degrees of difficulty. 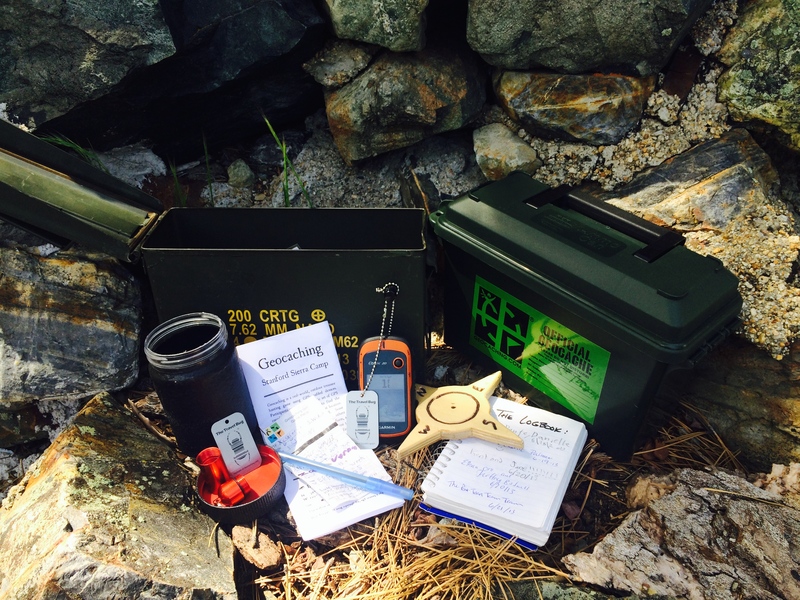 For a more comprehensive introduction and explanation, check out Geocaching Basics from REI and Geocaching 101 from Geocaching.com. SSC Geocache: "All too Eager"
While public geocaches are on public property, we at SSC have decided to join in the fun and offer something special: Over 25 unique caches hidden right here at Camp waiting to be discovered by our guests! For the uninitiated, we have GPS units available at the main office and a brochure with all the information you'll need to get started (and keep going). We've got basic hides for beginners, but plenty of caches that will keep even the most experienced geocachers occupied. And once you've conquered Camp's collection, there are some pretty awesome public geocaches right next door. 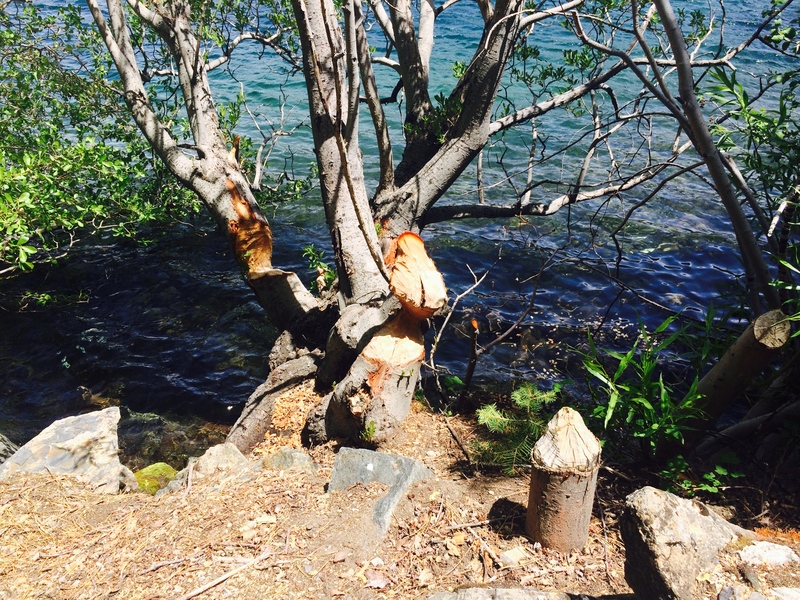 Take a stroll up to The Falls at Glen Alpine or down to the Fallen Leaf Marina. For those seeking something more adventurous, grab a kayak at the boat dock and cruise on over to find The Ghost of Captain Belle or put your hiking boots on and go explore the Tamarack Trail. Geocaching is an activity the whole family can enjoy... and here at SSC we're happy to help open the doors to a whole world full of fun. On a calm autumn morning, Fallen Leaf Lake has an almost mirror-like tranquility to it. But as beautiful as it is on the surface, it may be what lies far beneath its gentle ripples that truly sets it apart from other alpine lakes. At over 400 feet deep, the waters of Fallen Leaf have kept a secret for thousands of years: An underwater forest, perfectly preserved. Only in the last decade have researchers begun to explore the frigid depths of Fallen Leaf. John Kleppe, Professor Emeritus at University of Nevada Reno, is credited with discovery of the forest...and that's not all. Kleppe found a green jelly-like organism living among the still-standing trees. Researchers have yet to determine what exactly these things are. A brief report ran on NPR a year or so back. What has attracted the most attention lately, however, is what we can learn from these forests. 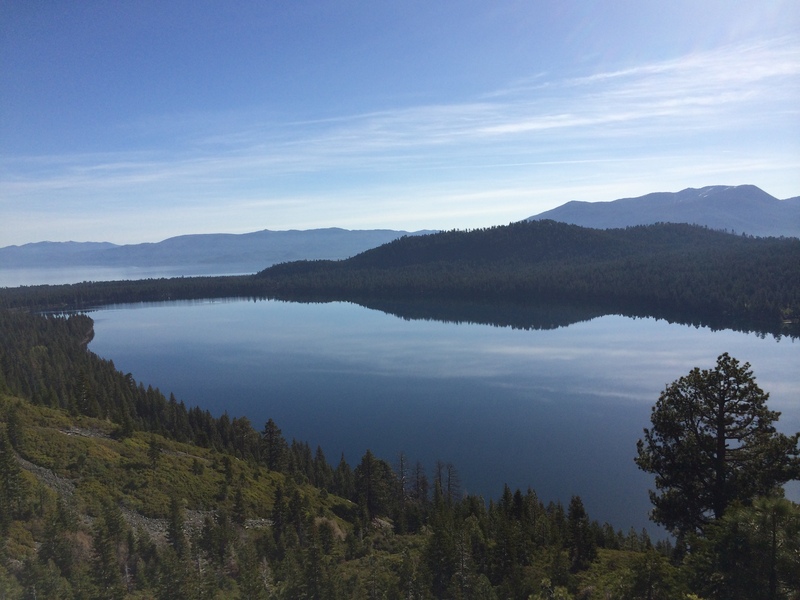 According to Graham Kent, Director of the Nevada Seismological Lab at UNR, the underwater forest can teach us a lot about megadroughts that hit California throughout the Holocene. "We’ve obtained potentially the most accurate record thus far on the instances of 200-year-long droughts in the Sierra," Kent said in 2012 UNR media report. 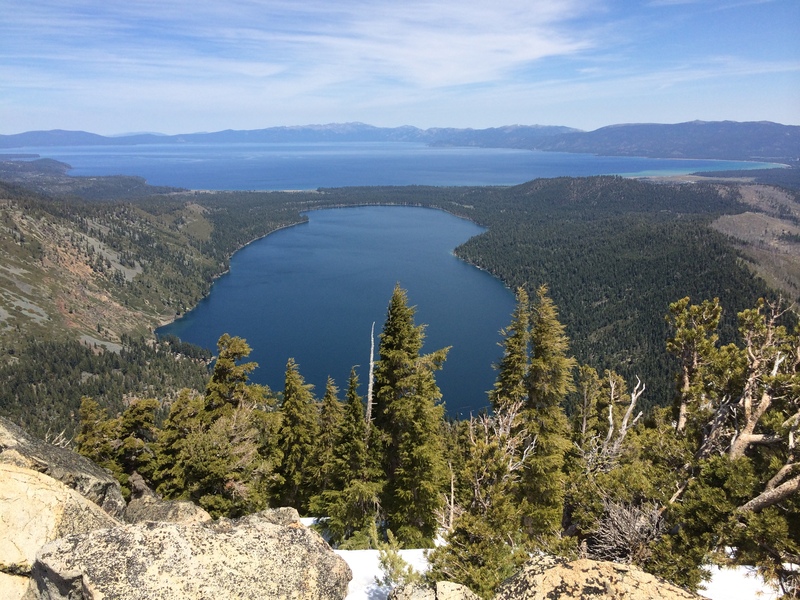 Kleppe has also published a paper on his research, entitled Duration and severity of Medieval drought in the Lake Tahoe Basin. The waters of Fallen Leaf Lake make for some of the best scenery in the Sierras, but it's the history they hide that is truly fascinating. Lodging at Stanford Sierra is not like your typical conference hotel. Instead of a conventional vanilla hotel room, you can enjoy comfortable accommodations with charming décor in a spectacular mountain setting. Need more convincing? Check out our top four reasons to stay with us. 1.Cabins While Stanford Sierra does offer hotel room style accommodations in the Main Lodge, when was the last time you stayed in a cabin while at a conference? Embrace your inner camper and enjoy standalone lodging with timbered ceilings and alpine décor, along with all the amenities you’d expect. There are 52 cabins scattered in clusters around the property, each with multiple bedrooms, an outdoor deck, and views of Fallen Leaf Lake and the surrounding mountains. 2. Balconies and Outdoor Decks Love the fresh air? Not only can you open the windows in all the rooms and cabins at Stanford Sierra (unlike some hotels), but all rooms and cabins boast either a private balcony or outdoor deck. Whether you need to unwind after the day’s sessions, or catch up on work, the al fresco setting is both relaxing and inspiring. Camp sits at the base of Cathedral Peak on Fallen Leaf Lake. 3. Views At Stanford Sierra you won’t see highways or urban streetscapes when you look out of your window. Instead you’ll gaze upon the cerulean blue of Fallen Leaf Lake and the craggy mountains of nearby Desolation Wilderness. If you time your visit just right, you may be privy to the explosion of fall colors that permeates our location in the autumn. 4. Amenities While we offer many of the hotel amenities you would expect, like free wireless internet, complimentary coffee and tea, and shampoo and other toiletries in the room, you’ll find plenty of unique amenities. Think peace and quiet, fresh air, spectacular views, beautiful sunsets, easy access to outdoor recreation, a lack of crowds and traffic, and a way to truly escape daily life. What happens when you bring together experts in an assortment of different disciplines to give TEDx style lectures at a picturesque setting on Fallen Leaf Lake? You get Stanford in the Wild , the newest alumni program at Stanford Sierra Camp. The inaugural three day event, to be held April 16-19, 2015, promises to be truly unique. Below are our top five reasons why you should plan on attending: 5. Presenters at the forefront of their field: It's not every day you can hear from authorities on such a variety of subjects. Host Tina Seelig, Phd, '85, is a national leader in engineering education, teaching creativity, innovation and entrepreneurship, who has put together a host of stimulating speakers. Presenters include J. Christian Gerdes, an associate professor of mechanical engineering whose laboratory studies how cars move, how humans drive cars an how to design future cars that work cooperatively with the driver or even drive themselves! At the other end of the spectrum, Kai Kight, '14, is a violinist and composer who challenges the perceived boundaries of the violin by creating music that connects the classical world with popular genres. 4. Networking: Not many TEDx events allow you to meet the presenters on quite the same level as Stanford in the Wild. Here you can connect with presenters and fellow attendees in an informal atmosphere. Chat over a delicious dinner prepared by Chef Dave, explore the hiking trails around Stanford Camp, or enjoy a port (and probably an informal jam session) by the fire in the evening. 3. Play time: While the mornings feature speaker presentations, afternoons are unscheduled, leaving you free to play however you wish. Whether it's something active, like hiking or kayaking, or a more relaxed approach, like enjoying the view of Fallen Leaf Lake from one of the many decks surrounding the main lodge, there are plenty of choices! 2. Escape from daily routine: Start your day with a yoga class overlooking Fallen Leaf Lake or sleep in! The relaxed and inspirational setting, the many different and interesting talks, and the unscheduled afternoon options are all fodder for creativity - and getting outside your daily routine. 1. The location: Stanford Sierra Camp's setting on the shore of beautiful Fallen Leaf Lake is truly special. The memorable and relaxing location includes comfortable lodging, healthy and delicious meals, plentiful outdoor activities, and amazing sunsets. Interested in attending? Download the reservation form or learn more. One of the great things about Lake Tahoe is the abundance of options. Whether it’s on the slopes of one of Lake Tahoe’s famous ski resorts, exploring the various neighborhoods surrounding the lake, or partaking in one of the many fun events that fill the Tahoe winter calendar, you have lots of choices. Which isn’t a bad problem to have. Going on now through the weekend is the Alpenglow Mountain Festival. It embraces all types of human-powered winter recreation like backcountry skiing, snowshoeing and Nordic skiing. The week is chock full of guided ski tours, avalanche awareness classes, winter film showings, Nordic ski clinics and snowshoe tours, with most events being free. The festival is a terrific opportunity to learn new skills, enjoy the winter wilderness with experienced guides, and meet new friends. Find the complete Alpenglow Mountain Festival schedule, map and additional details online or in person at Alpenglow Sports in Tahoe City. Also starting this weekend you can check out snow sculptures, frigid polar bear swimming, cross-country ski races, and live music —something for everyone at SnowFest!, which occurs February 27- March 8. Celebrating its 33rd year, the ten-day festival is a longstanding tradition in North Tahoe. Join the local community as it celebrates with parties everywhere from the ski slopes to the town centers. Lots of wacky fun at Snowfest! Notable festivities include Garwood’s Polar Bear Swim, fireworks, the Snow Queen Coronation, and the ever amusing dog pull, a friendly race for dogs of all sizes. Information and a full calendar of events can be found at TahoeSnowFestival.com. Combine world-class skiing and world-class bluegrass into the same day at Squaw Valley and you get WinterWonderGrass, to be held March 20-22. Stomp your ski boots to the likes of Sam Bush, Greensky Blugrass, Trampled by Turtles, Nicki Bluhm and the Gramblers, and many more bands. Dance to live music in front of an outdoor stage, and refuel in the two heated beer tents serving craft beer. The event brings 15 bands and 14 California breweries to Squaw Valley over three days. Tickets are available in single day and three day increments. Learn more and purchase tickets at WinterWonderGrassTahoe.com. If you plan to head to North Tahoe to attend these great events, our sister property, the Stanford Alpine Chalet, has rooms available. Give Brian a call at 530-583-1550 to make your reservation! As of August 2014, Camp’s store, the Fountain, has a new manager! Jonny Dacus has taken on the task of stocking our store with drinks, treats, hiking supplies and plenty of Stanford Sierra Camp clothing for kids and adults. I caught up with Jonny (who I also happen to share an office with) last weekend to find out more about him. I also wanted to know if he had any insider information he wanted to share about the Fountain! How long have you been at Camp? This fall is my sixth season at Camp. In Spring 2013, a friend convinced me to come out to California and be a raft guide for the season. The job fell through because the low snow level that winter didn’t provide for much of a river-rafting season that spring or summer. A friend of a friend told me about Sierra Camp, and I arrived two weeks late in the season. After being here only a few days, I knew Lake Tahoe and Fallen Leaf Lake was where I wanted to spend some time. Where did you grow up, and do you think you’ll ever live there again? I grew up in a small town, Hendersonville, Tennessee, just outside of Nashville. I don’t think I’ll ever live there again, but I will be back to visit family and friends. I’m not quite ready to fully settle down—there’s still so much to see in the US! But for now, Fallen Leaf Lake has me, and I’m pretty excited about being here for a few years. What’s your favorite thing about Camp? The setting and scenery. Being so close to Desolation Wilderness is amazing. My favorite lake in Desolation Wilderness is Clyde Lake. It’s about eight miles from Camp just off of the Pacific Crest Trail and on the other side of Mosquito Lake. What’s the most useful thing we sell at Camp? Maps! We have a large topographic map of Desolation Wilderness and whether you’re curious about the area surrounding Camp, or you’re ready for some serious hiking, it’s a great thing to have. What should someone be sure to purchase when visiting the Fountain? Anything that says SSC! We have a lot of gear downstairs and with a shirt or water bottle you’ll always be reminded of how wonderful it is here. It’s also cool to see people wearing SSC gear when you’re outside of Tahoe—it’s a nice conversation starter! Will guests notice any changes or different styles when they shop in the Fountain next year? I’m going to focus on getting some bigger brands and more athletic gear in the Fountain for next season. The beer selection will also change a little, but I’m going to continue to stock lots of California and craft beers. What’s your favorite beer that we sell? 21st Amendment’s Brew Free or Die. Has anything surprised you about this job? I grew-up saying “yes sir” and “yes ma’am” a lot. I’m surprised at how many people don’t like it when I call them that! I got a few strange looks this summer. Do you have any fun facts about yourself? I’m not a big country music fan. I really only like the classics, but I did grow up in the same town Taylor Swift did! Do you have any fun facts about the Fountain? The most milkshakes that were made in a week this summer was 250. The Fountain is only open for an hour on Saturdays, so that is about 41 milkshakes a day during the other days of the week. That’s a lot of milkshake! As a member of the Stanford Sierra Conference Center reservations team, the most common question I hear is: “Which cabin is the best?” This is a difficult question to answer because all of our cabins have pros and cons which can be advantages or disadvantages depending on an individual’s particular needs. I'm a heavy sleeper, so noise isn't a big issue for me, but I'm not the biggest fan of a bright room in the morning. On the other hand, I know people who would much rather spend time in a well-lit room as long as there are soundproof walls! Well-rested and happy guests make thoughtful and engaged conference participants, so let’s make sure that guests are staying in cabins that will be a good fit for them and ensure a good night’s rest! Camp's cabins are clustered together and each cluster contains 4-6 individual two and three bedroom cabins, each with its own bathroom. Disclaimer: Requests for cabins are always welcome! We do our best to accommodate requests, but not all cabins are used for each conference, or cabins may be reserved on a first-come, first-served basis. We have twelve rooms in the main lodge on two different levels. Six of the twelve lodge rooms have lake views and four of those six have balconies. Rooms on the main level of the lodge are very accessible (two being ADA compliant). There is a set of stairs to get to the third floor of the lodge, where our balcony rooms are. For many conferences, lodge rooms are in high demand for individuals who appreciate being close to the meeting rooms and dining room. Highlights: Proximity to the meeting rooms, dining room, and fresh coffee that goes out at 6am every morning! Rooms in the lodge also have the strongest wireless connection. Disadvantages: Lodge rooms are the smallest accommodations at Camp and only six of the 12 have views of Fallen Leaf Lake. Additionally, being close to the action can sometimes mean more noise. These three cabin clusters line the main road coming into Camp. They are located on a flat road, and have varying amounts of stairs to the individual cabins. The two-bedroom cabins are on the second floor of each cluster, while the three bedroom cabins are on the first floor. Every cabin has a private deck and filtered lake views. Highlights: Proximity to the main lodge! The walk to the lodge is flat on a well-lit and well-paved road. These cabins also have some of the largest private decks. Disadvantages: Location on the main road into Camp. While these cabins are quiet at night, cars do drive past them during the day. These cabins are a stone's throw from the lake, but the lake view is partially obscured by large trees. Cabins in the hills give guests a different perspective of Fallen Leaf Lake. Some of the lake views from the decks are filtered, but they are all from above and some are spectacular! Cars rarely drive up the road to the Hills cabins, which makes for a very peaceful night! These cabins are not far from the lodge, but are up a hill (on a paved road). These cabins have two-bedroom cabins on the second floor and three bedroom cabins on the first floor. Highlights: Sunlight and quiet are the highlights! Disadvantages: The hill up to these cabins can be tough for guests with mobility issues. These cabins are located at the far end of Camp near the boat dock, basketball and volleyball courts, and the Munchkin Patch (Camp's playground). They all have views of Fallen Leaf Lake and shared decks. These cabins are closest to the lake out of any cabins. Highlights: Lake views galore! These cabins are also close to the Munchkin Patch, camp’s playground, and have few stairs (if any). The Willow and White Fir clusters are also closest to the parking lot, so it's not a long trek if you've forgotten something in your car! Disadvantages: These cabins are a 4-6 minute walk from the main lodge. There are many trees in this area of Camp making for more shaded porches and slightly darker rooms (but this makes them great for sleeping in!). Still looking for more clarity on our cabins? Watch our YouTube video about lodging at Camp, or visit our website's interactive map. Katie’s Granola- A Healthy Start to Your Day! After I swim in the morning and come in to work, I’m ready for a big breakfast that will fill me up until lunch. Whether I’ll be sitting at my desk all day, in a morning meeting, or running around Camp before a group arrives, I’m always satisfied with Greek yogurt with fresh fruit and Camp’s house made granola. I love Camp’s granola! It tastes buttery (but there isn’t any butter!) and is usually packed full of yummy additions like coconut and raisins. After yogurt and granola, I’m ready to start my work day. I’ve always wanted to make my own granola, so I asked Katie Pileggi, Camp’s sous chef, if she would share her recipe. Lucky for me, and you, she said “yes!” Katie grew up in Reno and has been cooking professionally for the last 12 years. Her cooking experience includes pizza restaurants, catering companies, coffee shops, fine dining and most recently, a retirement community. Katie is in her second year as Camp’s sous chef. Her favorite thing to cook (and eat) is steak—medium rare, but if I could only eat one of Katie’s dishes or treats, it would be her granola! Katie created this recipe on her own with the intent of making it enjoyable for everyone. It is nut-free, vegan, and even gluten-free. I’ll admit it, I had to look up if oats were gluten-free or not, and to my surprise, they are! Katie’s recipe yields more than 60 servings, but I’ve modified her recipe so it yields 10 servings (approximately five cups). So if you’re looking for a healthy breakfast treat to fill you up for a day of meetings, hiking or relaxing, make sure you find some of Katie’s granola on the breakfast bar, or make your own! I enjoy Katie's granola with yogurt and fresh berries!